Scott has a PhD in theoretical chemical physics, was a National Research Council Fellow, and works as a computational chemist doing drug discovery research. He has made substantial contributions to the areas of statistical mechanics, kinetic theory, glass theory, liquid dynamics, and computational drug discovery, with his work appearing in several scientific journals. He has also written popular science, science education, and science communication articles for The Huffington Post, Forbes, Scientific American, and Discover. He resides in San Diego, California, with his family. The Cosmic Machine takes you from the earliest scientific inquiries in human history on an exciting journey in search of the answers to these questions. In telling this fascinating story of science, the reader is masterfully guided through the wonderment of how scientific discoveries (and the key players of those discoveries) shaped the world as we know it today. 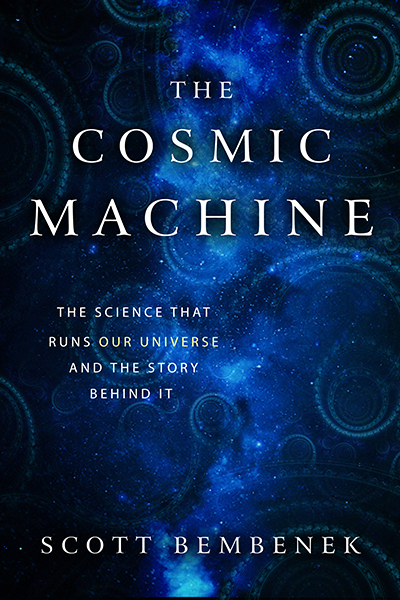 With its unique blend of science, history, and biographies, The Cosmic Machine provides an easily accessible account without sacrificing the actual science itself. Not only will this book engage, enlighten, and entertain you, it will inspire your passion and curiosity for the world around us.